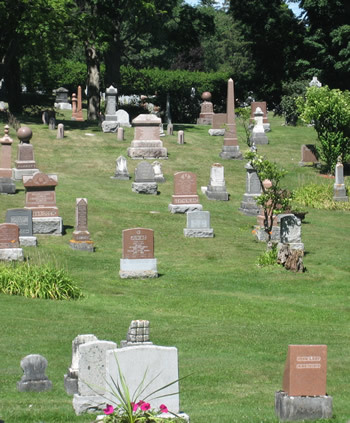 Here you will find a list of the local cemeteries. Each entry includes driving directions to help you locate the cemetery. To view an interactive map to the cemetery, please click on the map image alongside each cemetery name. Directions: Take Hwy 49 south out of Ripon 2.7 miles to Reeds Corner Road, turn left onto Reeds Corner Road. Cemetery is on the Left side of the road 7/10 of a mile from Hwy 49. Budsin Lutheran Cemetery. (St. John’s Lutheran Cemetery) Township of Crystal Lake, Marquette County. Directions: Take Hwy 23 west to Princeton. In Princeton take Hwy. 23 West to Montello. In Montello take Hwy. 22 right (north). Stay on Hwy. 22 North, you will see St. John’s Lutheran Church on your left hand side (west) of road. Turn there, left on County Road E. Cemetery is on corner of Hwy. 22 and County Road E.
Directions: Take Hwy 23/49 west out of Ripon to Hwy 49 north towards Berlin, turn right on Hwy 49 north go to County Road Brooklyn J, turn left on Brooklyn J. Cemetery will be on the right side of the road, 1.4 miles west of Hwy 49. Directions: Take Hwy 49 south out of Ripon to Brandon, once you enter Brand Village limits turn right at the first intersection turn right onto 3d Street (the Village Water Tower is on the edge of the Cemetery) Go south 1 1/2 blocks straight into the main gate of the Cemetery. Directions: Take highway 23 west out of Ripon, to Princeton. Located at the intersection of Hwy. 73 and County Road J on the northwest side of Princeton. Next to St. John’s Catholic Cemetery. Crystal Lake Emmanuel Cemetery. Township of Crystal Lake, Marquette County. Directions: Take highway 23 west out of Ripon, through Princeton, to Montello. In Montello take Hwy. 22 North. Stay on 22 North, cemetery is the second cemetery on the right hand side of the road about 10 miles out of Montello. Directions: Take Hwy 23 west out of Ripon to Green Lake, stay on 23 going around Green Lake to County Road A, turn left on A or North Street, going into Green Lake, Cemetery is on the left about 1/4 mile. Directions: Take Hwy. 23 west, past Green Lake to Hwy. 73 South. Turn right on 73 South and go approximately 4 miles. Cemetery is on the left hand side of road. East Side Cemetery. Township of Montello, Marquette County. Directions: Take highway 23 west out of Ripon, to Princeton. In Princeton take Hwy. 23 West towards Montello, Hwy. 23 curves and cemetery is on right hand side of road; one mile before Montello. Directions: Take highway 23 west out of Ripon, through Princeton, towards Montello. Turn left (South) on Town Hall Road. Then turn right (west) on Evergreen Lane. Cemetery is on right side next to church. Directions: Take County Road E from Ripon South to Fairwater. Cemetery will be on the left as you come into the Village of Fairwater. The cemetery is 6 miles from Ripon. Directions: is on Congress St. Starting in front of Pizza Hut at the stop and go light, heading west toward Green Lake, turn left onto Union Street. Go to the fifth street on the left, which will be Congress St and turn left. Cemetery will be on the right, at the bottom of the hill. Germania Cemetery. Township of Shields, Marquette County. Directions: Take highway 23 west out of Ripon to Princeton. Take Hwy. 73 North out of Princeton about 4 miles and turn left (west) on Eagle Road. Stay on Eagle Road and go past Germania Lutheran Cemetery. About 1 mile farther down road is cemetery on the right hand (north) side of road. You can’t see the cemetery from the road only the red gate to the cemetery. Directions: Take County Road E south out of Ripon toward Fairwater. At the Stop sign on Hwy KK turn Right or west. Go to County Road A (another stop sign). Turn Left on County Road A to County Road K (first intersection) turn right, cemetery will be on the left at the next stop sign. Directions: is also on Congress St use the same directions as Garden of the Cross Cemetery, only now you continue up the hill and the main gate to the cemetery is on the right. Directions: Take Hwy 44 East to Pickett, go through Pickett and the cemetery is on the right side of the road. Directions: The County E (Eureka St) north out of Ripon to Cork St. Road, turn right, the cemetery will be on the left 1/2 mile. Directions: Take highway 23 west out of Ripon, to Princeton. From Hwy. 23-73 in the City of Princeton turn left (south) on Farmer St. Go about ½ mile and cemetery is on left side of the road. Montello Cemetery. City of Montello, Marquette County. Directions: Take highway 23 west out of Ripon, through Princeton. Take Hwy. 23 West out of Princeton to Montello. Stay on 23 West through downtown business district, Just past business district is the cemetery on the right hand (north) side of the road. Directions: Take hwy 23 west to the Ripon City limits (By Alibi's) turn Right on old Hwy 23 go Koro Rd and turn right onto Koro Road heading North. Follow Koro Road until it comes to a `T' intersection where you turn right. The Cemetery will be on your right less than 1/4 of a mile. Neshkoro Village Cemetery. Village of Neshkoro, Marquette County. Directions: Take highway 23 west out of Ripon, to Princeton. Take Hwy. 73 North out of Princeton to Neshkoro. Go over bridge in Neshkoro and past St. James Catholic Church. Cemetery is the last cemetery in Neshkoro on the left hand (west) side of Hwy. 73. Directions: Take Hwy 23 east out of Ripon toward Rosendale. At the stop light in Rosendale or Hwy 26 turn right and the cemetery is on the right 1/2 mile. Directions: Take highway 23 west out of Ripon, to Princeton. Take Hwy. 73 North out of Princeton to Neshkoro. Go over the bridge in Neshkoro. Go past St. James Catholic Church, the last cemetery on the right hand (east) side of Hwy. 73 is the cemetery. Directions: Take highway 23 west out of Ripon, to Princeton. Located on Hwy. 73 on the northwest side of Princeton. Next to St. John The Baptist Catholic Church. St. Paul’s Lutheran Cemetery. Township of Newton, Marquette County. Directions: Take highway 23 west out of Ripon, to Princeton. Take Hwy. 23 West out of Princeton to Montello. Turn right on Hwy 22 North. Go past Hwy. E marker on highway and take first left hand (west) turn on Dover Road. Stay on Dover to the second T intersection and turn right (north) on Hwy. Y. Stay on Y to the cemetery. Directions: Starting on Hwy 23 west, go to Arcade Glenn Road (at Alibi's) turn left. Follow Arcade Glenn Road until it comes to Dartford Road, which is a "T" intersection, and the cemetery will be on the Left. There will be two driveways going into the cemetery just before you get to the stop sign. State Center Cemetery (aka St. Marie Cemetery). Township of St. Marie, Green Lake County. Directions: Take highway 23 west out of Ripon, to Princeton. In Princeton at intersection of Hwy. 23-73, location of Sherm’s Grocery Store, take Fulton St. North. Stay of Fulton St. and turn left Northeast) on Hwy. J. Stay on J about 1 mile and go straight through intersection on Huckleberry Road. Cemetery is on right side of the road. Directions: Take highway 23 west out of Ripon, through Princeton. Take Hwy. 23 West out of Princeton towards Montello. Turn left (south) on County Road C. Follow C to Fern Drive. Turn right (west) on Fern Drive. Cemetery is ½ mile down road on right hand side next to Trinity Lutheran Church. Directions: Take highway 23 west out of Ripon, to Princeton. In Princeton take Hwy. 23-73 east 3 miles to Hwy. 73 South. Turn right on 73 South to County Road T. Turn left (east) on T and go about ½ mile. Cemetery is on the left side of road. Directions: turn left onto Union St. from West Fond du Lac St.(same as Hillside Cemetery directions) go to State St which will be the fifth street on the right, turn right onto State St and the cemetery will be on your left. Zion Lutheran Cemetery. Village of Neshkoro, Marquette County. Directions: Take highway 23 west out of Ripon, to Princeton. From Princeton take Hwy. 73 North to Neshkoro. Go across bridge in Neshkoro. Just past Zion Lutheran Church and St. James Catholic Church on the right and left hand side of Hwy. 73 is the cemetery. Zion United Methodist Cemetery. Village of Neshkoro, Marquette County. Directions: Take highway 23 west out of Ripon, to Princeton. In Princeton take Hwy. 73 North to Neshkoro. Go past the bridge in Neshkoro and turn right (east) on Bluff St. Cemetery is on left side next to Zion United Methodist Church.